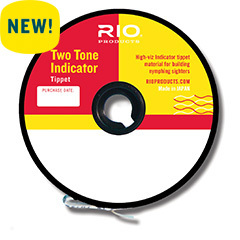 This Rio Two Tone Tippet material has opaque two tone 8” sections of fluorescent pink and fluorescent chartreuse colour changing tippet with highly defined hard colour changes. These colour breaks create maximum contrast to allow anglers to get visual cues when tight line nymphing. The best indicator material for building sighters for European Style Nymphing.